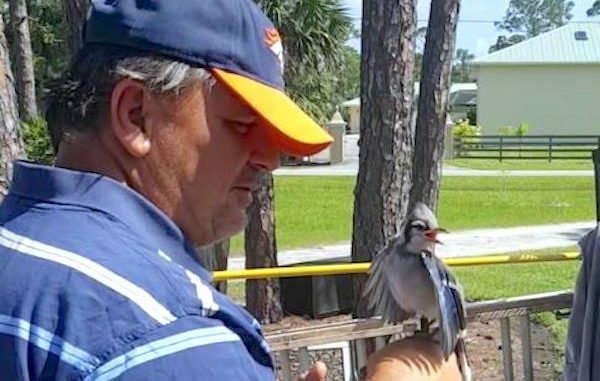 SEBASTIAN – A couple of people in Barefoot Bay have reported a “Killer Blue Jay” on the loose. Some people say the blue jay will dive down at them at a high rate of speed, buzz their heads, then appears to be trying to peck their eyes out. “It turns out Lucky was just really hungry. If you stand still, he will land on your finger or shoulder with his mouth open and wait for you to feed him something,” Pat Burke said. One of their neighbors has been feeding the blue jay for two weeks, unbeknownst to everyone else. “Wanted you all to know that if you run into Lucky, consider yourself Lucky and know that Lucky is not an escapee from Alfred Hitchcock movie, but a cool little guy that just wants some food and some of your time,” Burke said. Blues Jays are fond of acorns, peanuts, corn, and black oil sunflower seeds. These birds enjoy eating from grain and suet feeders. Just make sure there’s a source of water nearby for the blue jays to drink and bathe in. Keep in mind that blue jays are feisty, and will often force smaller birds away from the bird feeders.